"World To End on December 21, 2012" should be a headline reserved for the National Enquirer at check-out stands in your favorite grocery store but this story has been covered by serious news outlets. The excitement comes from the accurate Maya Calendar begun over 5,000 years ago and still in use by the Maya people of Guatemala and Mexico. As the end of this 5 millennial calendar cycle approached, much attention has been given to the event. Yet, it’s really just a reset of the calendar for another 5,126 years. There will be celebrating on December 21st as a rebirth of their civilization but no preparations for the apocalypse. 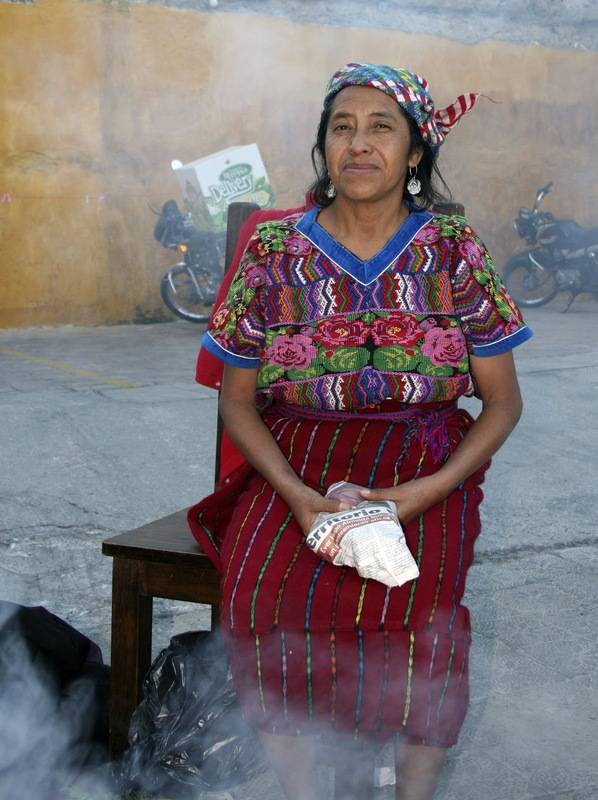 A byproduct of the spotlight on the Maya Calendar has been the “outing” of their ancient Fire Ceremony. When Spaniards arrived in Central America over 500 years ago, Maya temples were destroyed and all residents ordered to convert to Catholicism. Not surprisingly, natives took their religion underground. 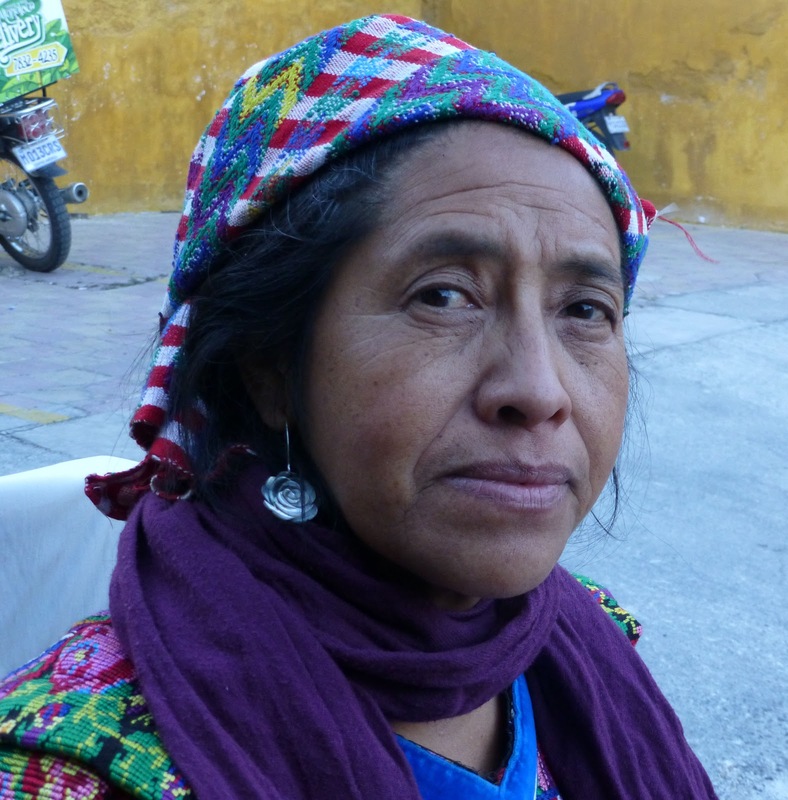 Because of the recent interest in the Maya Calendar, the indigenous of Guatemala have had many inquiries and have begun to more openly share their beliefs and ceremonies. We were fortunate to experience their powerful Fire Ceremony with Calista Gabriel, one of the 3,000 mostly female Shamans, or guides, in Guatemala. Calista was a political refugee in the United States during the Guatemalan internal war in the 1980s. 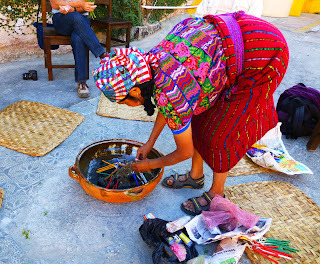 She returned and is part of the Maya artist movement. With three university degrees and three languages, the diminutive native was knowledgeable and self-assured. On our hotel’s enclosed parking lot, we sat in a circle of 8 chairs surrounding a large, low, round ceramic pot . Calista started the wood fire and lit a rue branch. “Don’t be scared of smoke” . She asked us to use fire as medicine. “Talk to fire.” “Connect with it. Tell it your name.” As she waved the smoking branch around each of us, we introduced ourselves and verbalized what we hoped to receive from the ceremony. One wanted direction and healing for his family, another cure for a son, another wisdom, and one for forgiveness for the overuse of earth’s resources. As she swept our bodies, Calista noted we were part of the creation but have become artificial. In villages, there is more connection among neighborhoods. In the city, we are as she said “more weak” because of the disconnect. As the plant crossed our heads, she talked of cleaning our “corona”, our antenna, and purifying our energies. A sprinkling of flower water on us was the final preparation for the calling of the four directions. 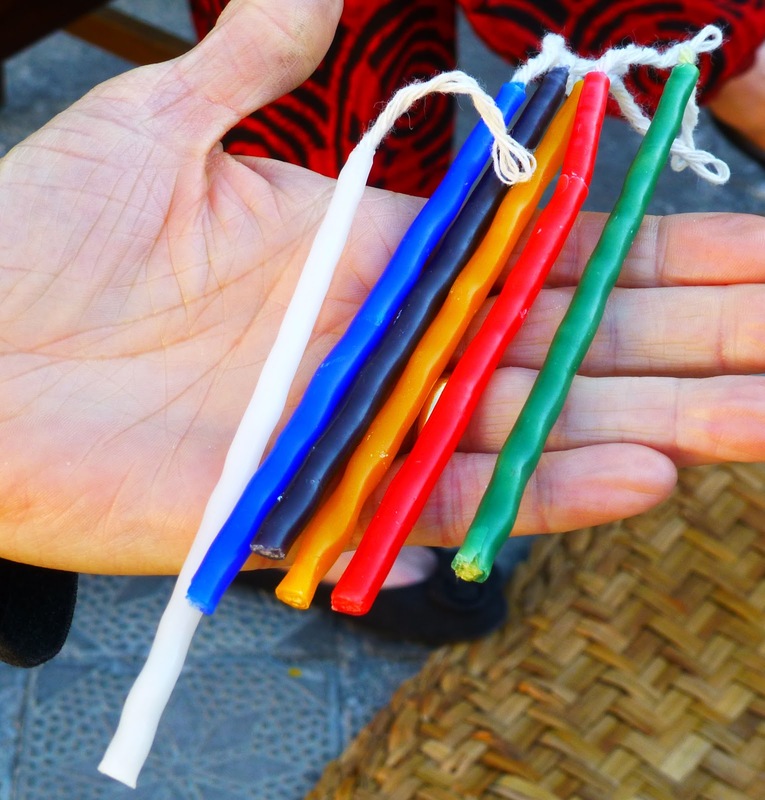 Candles are integral to this experience and Calista pulled them out of her backpack. Red is for East and the color of blood, black for the west and earth, white is from the north and represents air, yellow the south and color of skin. Blue is in the center of the cosmic cross and stands in for water and sky while green does so for plants and mother earth. As our leader explained the meanings of each candle in her three languages of Kaqchikel, Spanish and English, we individually placed ours in the fire with a prayer or observation. The most moving was the last, a lard candle made from animal fat standing in for our ancestors. We all had special prayers for those who came before us. At the end, Calista made the sign of the Maya cross, different than that of our Catholic brethren, indicating the balance of nature. A final traditional embrace began with Calista hugging each of us as we individually followed her around the circle. This is not a conversion opportunity. No one wants you to change religions. You are either Maya or not - like being Jewish. 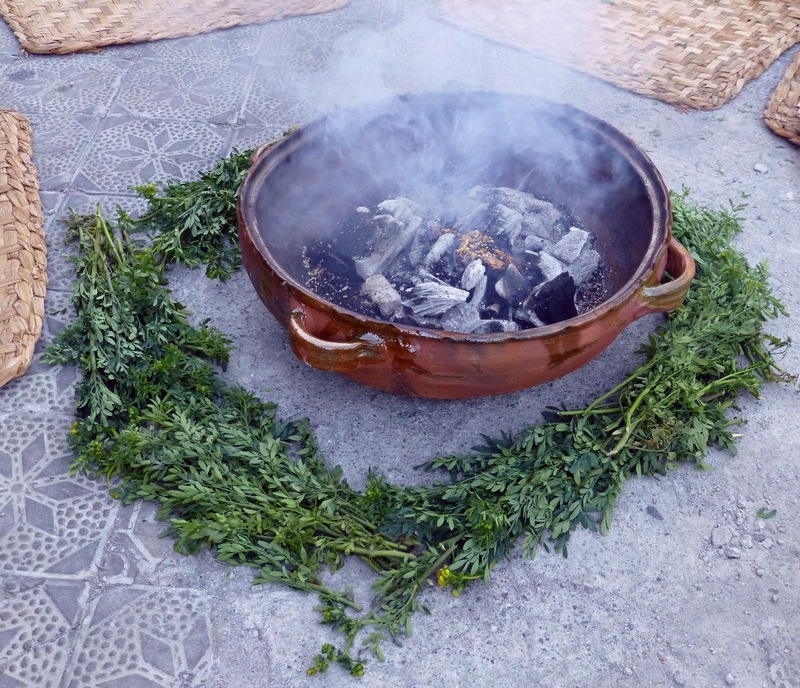 Yet it is a recognition that we are all spiritual beings and it can be a cleansing ceremony allowing participants to release petitions up to creation through nature’s fire and smoke. My guess is that there will be many of these ceremonies on December 21st as the Mayas give thanks and celebrate their rebirth. 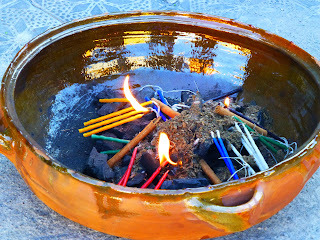 To experience a Maya Fire Ceremony with Calista Gabriel, contact Elizabeth Bell at http://www.antiguatours.net/index.php. The deep gravely voice answering the phone at Paris Community Theater belongs to Alan Jones, his native Canadian accent noticeable only the words about and out. As manager, actor, and general flunky of the theatre, Alan uses skills he’s developed over a lifetime of show-biz, beginning at age 19 when he ran away to the circus for the first time. How he arrived in Paris takes some telling. In 1972, Alan was studying theater and design when the Garden Brothers Circus came to Burlington, Ontario, a suburb of Toronto, as a fund raiser for the local band. Jones liked the family atmosphere, thought the circus a lot like theater, and hopped on board, leaving a note for his mother... “Sorry, Mom, but had to do it.” After a season of grooming and cleaning horses and the big cats, he returned home, only to skip out again the next year. Alan moved up to popcorn management but soon got into the entertainment side. “I clowned for that show,” he noted. No training was necessary for this new position as Jones was a natural comedian. American clowns like simple slap-stick humor as compared to the more theatrical, mime-like European performers. He began working with a family whose circus traveled to the United States where weather was warmer. In 1984, some friends were opening their own Kelly Miller Circus out of Hugo, Oklahoma and wanted him to run the administrative office. He bought a house and settled down as much as a circus employee can. When Jones retired, the nearby Paris Community Theater drew him back into theater where he had started. According to Alan, the circus is a “hard life”. For his first job, he slept in a hayloft above the big cat cages, allowing the tigers’ gentle snoring to lull him to sleep. Sleeping quarters evolved over the years. A truck will now contain six dormitories for single employees and professionals have their own trailers. An afternoon nap is still essential, though, between the morning set-up and evening show. Originally, circuses were made up of families with three generations of performers. Grandfathers could be seen instructing grandchildren. Italians rode horse back, Mexicans or Argentinians tamed the trapezes, and eastern Europeans could juggle and teeterboard. Because of the international presence, Alan loved parties when everyone brought their own ethnic food. Special bonds were formed within the extended circus family although a hierarchy existed depending on the difficulty of your act. Some stories stand out like the tent that was blown down by a tornado. But one he’ll never forget was 9/11. He was with a circus in Colorado for a Hot Air Balloon festival. The word came of the tragedy as they were watching balloons go up. All rushed to the trailers to watch the event. The circus was cancelled that night but proceeds from the next night’s performance were donated to the Red Cross. Alan fears the traditional circus is dying. It’s very hard to be profitable with all the required insurance - employee, vehicles, general liability, workman’s comp. The families are no longer tight. “It’s just a job,” he says. Cultural icon, Cirque du Soleil, incorporates many traditional circus acts with a lot more imagination. Gymnastics overshadows other skills. Alan wouldn’t even consider it a circus but it is encroaching on traditional circus crowds. After 35 years of crossing the country, Jones was happy to stay permanently in Hugo. In retirement, he has combined his two interests - theater and animals. Six days a week Alan volunteers in the mornings at the animal shelter caring for the cats. In the afternoons, he’s managing Paris Community Theater. He believes the talent and energy in Paris is unique for a community this size and he loves it. And he has no plans to run away to the circus a third time.